Enduro shot and edited for LA Splash Cosmetics. SCE (Southern California Edison) just shut our power off an hour ago and my drives are off, display is off, printer is off (not like I print much anyway as I'm patiently awaiting a new Canon PIXMA 9500 MKII printer head and ink), and admittedly it's kind of nice having all these "distractions" turned off. Running on battery power on the MacBook Pro and tethered to the iPhone for Internet. Maybe I should disconnect from the Internet too? Now that would really feel like "old times". I loved this shot. I haven't talked at all about this shoot and I probably will shortly in a web video or video journal. I'm starting/trying something new but it's still too early to unveil anything. I'm not even sure what's going on but as I mentioned last night, "something is happening". Quickly on the retouch of this shot. It took me at least 3 sittings to finish this image. Cracked/dry skin, overdrawn lips, difference in exposure, eyebrows, etc. each face required at least 1.5 hours to edit and since there are 3 faces I spent at least 4.5 hours on this shot when it was all said and done. I liked this shot but I'll be the first to tell you that editing beauty shots of multiple faces is tough! When I posted about the new webinar video I suddenly realized I hadn't posted anything here in weeks. It's not that I don't have anything to say. I have plenty to say. I don't post as often because I'm not sure this is the proper medium for my posts. It was certainly easier to talk about my journey as a photographer when I was anonymous. I didn't have to think about the repercussions of my posts. I didn't have to consider how this content would be received. In essence I would post whatever I wanted whenever I felt like it. My posts would be half-baked thoughts, summaries, random ideas. These days I feel like I have to offer more complete ideas. Better educational pieces. Bullet-proof arguments. Questions with solutions. I have to be responsible to the audience and to the brand. But that sense of responsibility hinders my ability to produce content on a more regular basis. It means that there are several unfinished and unpublished posts on this blog. It means I can't share all the ideas that I have in my head. But what it really means is that weeks can pass without any activity on this blog. It's finally done. 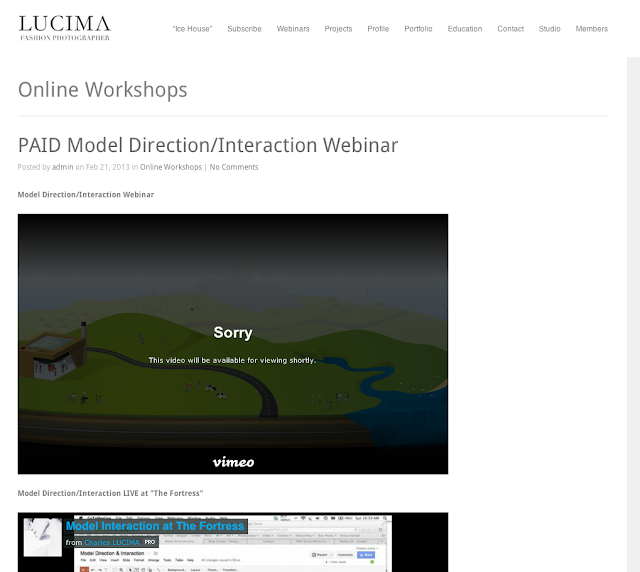 Today's webinar is now part of a 3-part (soon to be 4-part) Model Interaction/Direction webinar. It took 3 tries but today's was arguably the best yet. Thanks to Kevin, Mark, Rodney, Joel, Gianni, Matt, Jim, and Ken hopefully I didn't forget anyone but thanks again to all the workshop photographers. As you can see the video is uploading as we speak. It will take a good 1/2 day so check it tomorrow (if you're registered) and it will be done. I'll be emailing the slides now to all enrolled in this webinar! For non-registered photographers please see here for the registration page!